STEM-tastic After School Activities in Region 3 is an After School Region 3 blog post about the Grass Valley School District gathering at Lyman Gilmore Middle School (over 1,000 students) on May 21, 2014 to celebrate the 112th anniversary of Lyman Gilmore's supposed maiden flight. "The regular day staff, the after school staff, local businesses, and the community came together to put on the Second Annual Flight Day. The event not only included a fly over by roughly 15 local pilots, but it also included many hands-on, inquiry-based activity booths where the students were able to explore and learn about the principles of flight as well as engineering." 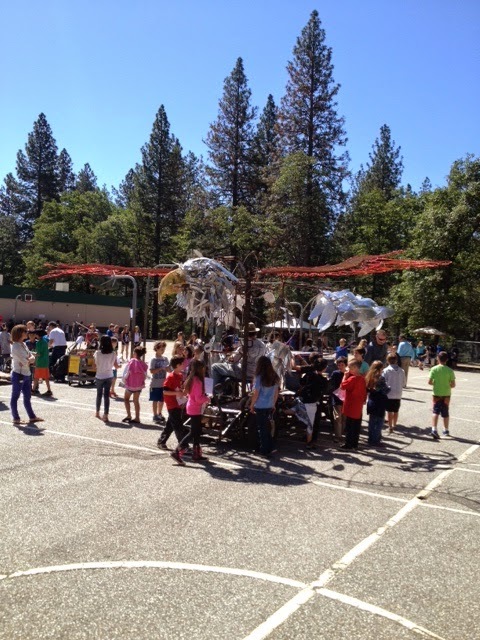 Here, the students are checking out an eagle bike.